Catch "The Big Debate: Dinokeng Scenarios" on Wednesday this week, 9pm 4th November, eNews Channel. This is the first of 6 weekly episodes each debating issues related to Dinokeng Scenarios. eTV every Friday at 10h00. The programmes will be rebroadcast each week on the eNews Channel at these times: Thursday 23h00, Friday 09h00, Friday 20h00, Saturday 06h00 and Sunday 08h00. And look out for the first of 5 weekly supplements to accompany each theme of the shows. "3 Futures" will be printed in The Star, Cape Argus, Pretoria News and Daily News starting today, Monday 2nd November. 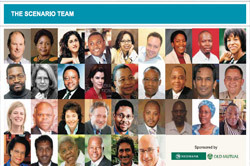 These supplements will also appear on the http://www.iol.co.za/ website of the Independent Newspapers.